Earth Day is an annual event celebrated Worldwide on April 22 and various events are held to demonstrate support for environmental protection. With Earth Day just around the corner, this wonderful book is just what you need to make your kids proud to take care of our planet Earth! 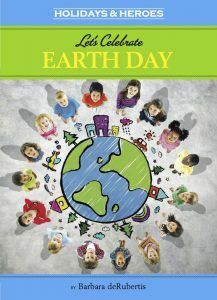 Lets Celebrate Earth Day encourages young readers to learn about why this important holiday was created and about the many little things we can do to make big changes in the health of our planet. I love how this book focuses more on solutions than problems. The illustrations are incredible. I love the fun colour photos throughout the book that conveys a positive message with vibrant strength. This book celebrates the Earth heroes who created this important April holiday and explores the ways we can make our planet a safer and healthier place to live. This book describes how Earth day was first celebrated in 1970 and at present, Earth Day events in more than 193 countries are now coordinated globally by the Earth Day Network. Earth Day was founded by United States Senator Gaylord Nelson as an environmental teach-in first held on April 22, 1970. Nelson was later awarded the presidential medal of freedom award in recognition of his work. The first Earth Day celebrations took place in two thousand colleges and universities, roughly ten thousand primary and secondary schools, and hundreds of communities across the United States. More importantly, it “brought 20 million Americans out into the spring sunshine for peaceful demonstrations in favour of environmental reform. It is now observed in 192 countries, and coordinated by the nonprofit Earth Day Network. This book also educate readers about how first Earth Day led to some important laws being passed such as the creation of Environmental protection agency, the clean water act, The Clean Air Act and The Endangered species Act. Author points out various ways to celebrate Earth day every year by helping to protect the Air, water, land, plants, animals, and people on planet Earth. Author advises readers to use various forms of energy only to the required amount that too when needed. Kids should be trained to plant saplings and make their premises green. Trees reduce the atmospheric pollution and produce fresh air for us to breathe in. This book also explains how our human population is growing and so do our demands on the Earth to help us live with light, water, heat and food! The Earth can only reproduce these things so fast and if we don’t work hard together we could run out of these resources. To help save the environment there are many easy ways to use less electricity. The simplest thing is to remember to turn the lights off when you leave a room. There is also shortage of water in many places on earth and clean water is the most precious resource available on earth. To help save water, we should use less water for baths, we should also turn off the water when not required. And finally, by starting with little things we can do every day, we can learn to solve new problems that arise. Then we will have a healthier Earth to pass on to our children and that will be worth celebrating! It is a beautiful book with an important message and wonderful tips on improving the environment and making this world a better place to live. I would recommend it to kids and adult of all ages. I think this book will also encourage and entertain children during the festive period of Earth Day celebration. This book is highly educational and fun to read! Give your child an access to Lets celebrate Earth Day and over 20,000 more great books for free for two months! Click on the banner below and use the promo code Jedlie to try Epic for free for two months.